Hi, my name is Ed - I'm one of the Year 3 students involved in the CARER pilot and am part of the Aberystwyth team. I signed up to try CARER because it looked like it would suit me and that I would learn things I really value academically like good, routine clinical technique and natural patient rapport. 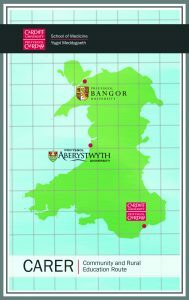 I knew nothing about Aberystwyth before deciding to move there for the year, but some quick research revealed a university town in a stunning setting between the coast to the West and hills and valleys to the East. Originally I hail from Kent and outside studying I like cross-country running, as well as cooking and reading.